A fine delightful oil on canvas by Newlyn listed artist Samuel Lamorna Birch. 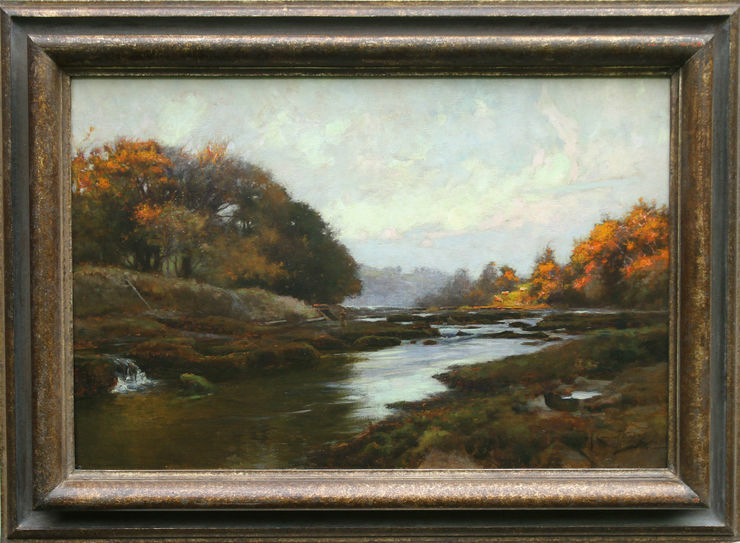 Painted circa 1895, it depicts the River Lune and fisherman near Lancaster and is a stunning example of early British Impressionism. The colours are just beautiful, very vibrant and in gallery condition. This is one of the best early works by this artist. Signed lower right. 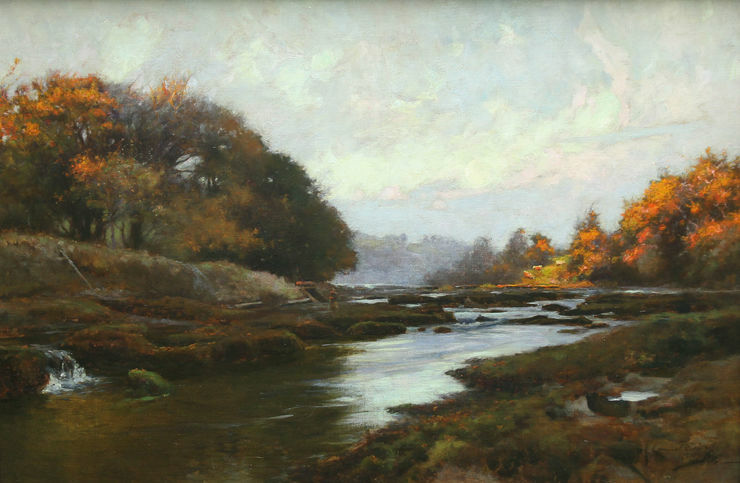 Samuel John Lamorna Birch (1869-1955) the leading figure of the second flowering of the Newlyn School, Samuel John Birch was so smitten with the Lamorna valley and cove that he took its name as his own, becoming known as Lamorna Birch. Samuel John Birch was born in Egremont, Cheshire. Apart from a brief period of study at the Atelier Colarossi, Paris in 1895, he was largely self-taught as an artist. Birch first visited West Cornwall in the late 1880s and settled in the Lamorna Valley in 1892. He adopted the epithet ‘Lamorna’ in 1895 to distinguish himself from fellow artist Lionel Birch (an idea suggested by Stanhope Forbes). He is regarded as the father figure of the later group of ‘Newlyn’ artists, which included Laura and Harold Knight, Alfred Munnings, Frank Gascoigne Heath and Stanley Gardiner, known as the Lamorna group. Birch was elected as an Associate of the Royal Academy (ARA) in 1924 and was made a full Royal Academician (RA) eight years later. In his long and distinguished career, he exhibited over 200 works at the Royal Academy, as well as exhibiting throughout the Country and abroad.